Encore Electric, Inc. received the Grand Champion Award at the Willis Towers Watson Safety Awards Luncheon, representing the best firm in the Specialty Division with 1.25 – 4 million work hours reported without any safety issues. 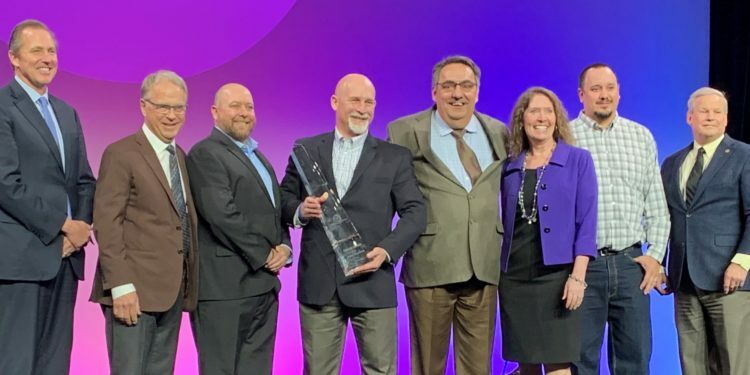 DENVER — Ten Associated General Contractors of Colorado (AGC/C) member firms were honored as National Finalists at the 20th Annual Construction Safety Excellence Awards (CSAE), that took place April 3, 2019 at AGC of America’s 100th Annual National Convention in Denver. These awards recognize AGC Members who have developed and implemented premier safety and loss prevention programs and utilize continuous improvement efforts to elevate their safety and health management systems. Thirteen AGC/C member companies applied and ten were selected as finalists. “We are honored to have so many our members recognized at the national level for their commitment to safety. Despite the increasing pressures construction firms are facing with constrained project budgets and lack of skilled labor, they have not wavered in their efforts regarding safety training, work site hazard controls and continued safety program innovations,” said Michael Gifford, president and CEO of AGC of Colorado. Members of the AGC Safety & Health Committee reviewed all of the submittals back in January 2019 and finalists in each divisional category competed at the AGC National Convention for either a 1st, 2nd or 3rd place award. Finalists were also given the opportunity to present an oral presentation in front of five judges. Encore Electric, Inc. was honored with the Grand Champion Award at the Willis Towers Watson Safety Awards Luncheon, representing the best firm in the Specialty Division with 1.25 – 4 million work hours reported without any safety issues. The following Colorado firms took home first place awards: Iron Woman Construction & Environmental Services in the Heavy Division for more than 500,000 work hours; Haselden Construction, LLC in the Building Division for more than 1 million work hours; Concrete Frame Associates, LLC in the Specialty Division for 350,000 – 750,000 work hours; MTech Mechanical in the Specialty Division for 750,000 – 1.25 million work hours; Encore Electric, Inc. in the Specialty Division for 1.25 million – 4 million work hours. Second place firms from the AGC/C membership include: Glacier Construction Company, Inc. in the Utility Infrastructure Division for under 200,000 work hours; Fiore & Sons, Inc. in the Specialty Division for 350,000 – 750,000 work hours; HC Beck Ltd. in the Construction Management Division for more than 3 million work hours. Two Colorado firms placed third in the CSAE Awards, including: Saunders Construction, Inc. in the Building Division for over 1 million work hours and Kenny Electric Service, Inc. in the Specialty Division for 750,000 – 1.25 million work hours.